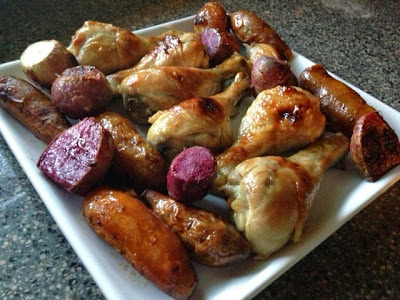 I love roasting chicken and vegetables in the fall and winter months. Roasting veggies brings out their natural sugars, and the caramelized flavor that results will make your taste buds sing. Add another layer of flavor with a maple syrup glaze and you will please the pickiest of eaters, or at least Buddy the Elf fans. 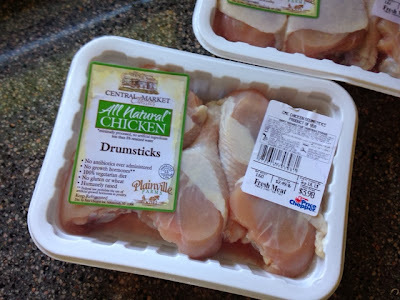 My son Jack loves drumsticks, so I thought I would use those in this dish, but this recipe will work with any chicken part that is on the bone. 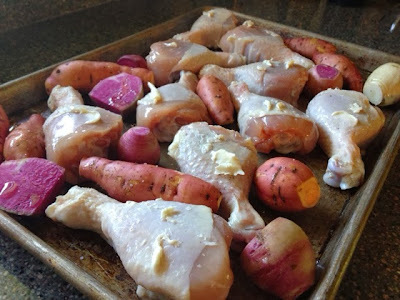 Also, I used yams and turnips but feel free to use any root veggies you like. 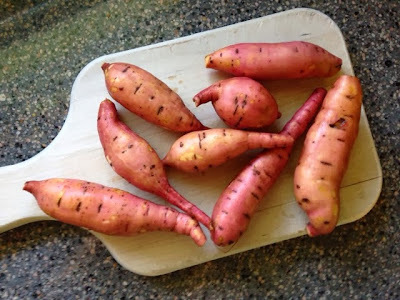 I got these cute baby yams at our local produce store, Stern's Quality Produce. 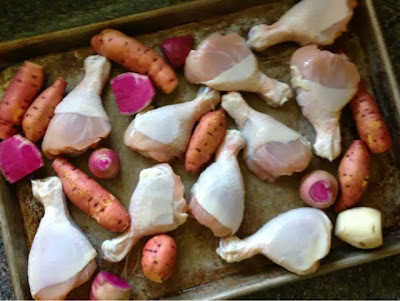 I also decided to step outside my comfort zone and try turnips. 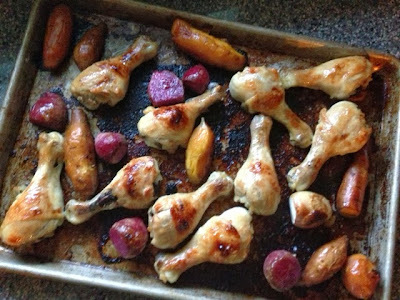 Place the drumsticks and veggies on a large baking sheet. Place little pieces of butter on the drumsticks. 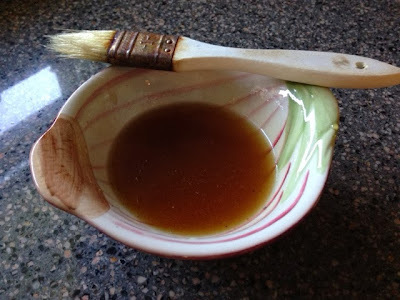 This will give them a nice browned skin. While the chicken and veggies are cooking, prepare your glaze. 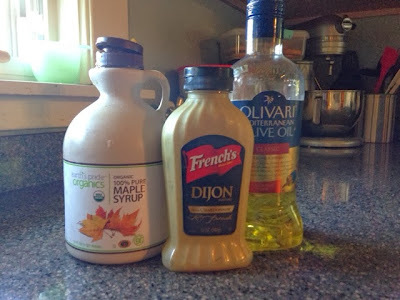 In a small bowl, combine the olive oil, maple syrup and Dijon mustard. 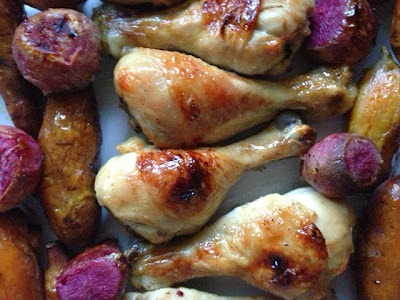 Remove chicken from oven after 30 minutes, and brush everything generously with the glaze (reserve a small amount to use later). 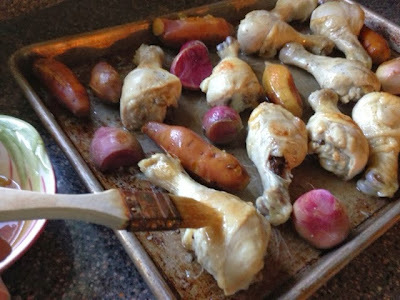 Return pan to oven for 20 more minutes, until veggies are fork tender and chicken is cooked through. 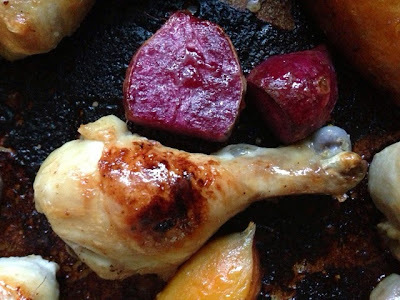 Remove from oven and brush one final time with the reserved glaze. 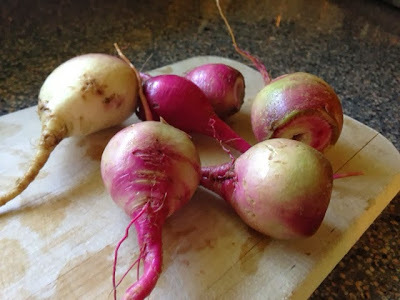 I love the color of these turnips.